Listed in the National Register of Historic Places, Ramp’s Covered Bridge is the only remaining covered bridge still standing on its original site in Cumberland County. At one time, 37 covered bridges could be found in the county, but floods, fires and the passage of time have taken their toll on the others. Built in 1882 by Samuel Myers, Ramp’s Bridge encorporates the Burr Arch Truss style of construction. A less common feature in covered bridges is its window overlooking the Conodoguinet Creek on the upstream side. 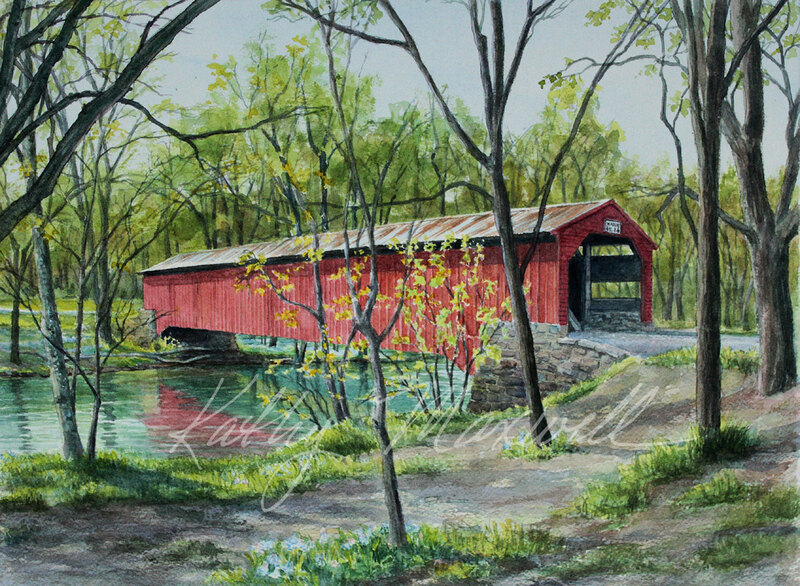 This painting depicts the bridge from the downstream side, but you can see the window through the entrance. The 130-foot long structure stands 18 feet, 11 inches tall and is located on Covered Bridge Road outside of Newburg, PA, seven miles west of Newville. Ramp’s Bridge is regularly inspected and is in remarkably good shape for its age. One can still drive through the single lane bridge, steering carefully to keep the car wheels on the raised tire planks. Some say that the reason bridges were covered and painted red was to fool the cows into crossing the water by making them think they were entering a barn. Other theories include providing shelter to travelers caught in a storm, or even rendezvous points for courting sweethearts. Romantic notions aside, early bridge builders knew that a covered bridge would last at least three times longer than an uncovered bridge. The roof itself added to the structural strength of the bridge, as well as protecting the wooden frame from the elements. Cumberland County residents take comfort in knowing that their last covered bridge is being protected and maintained, and this quiet, picturesque reminder of earlier times can still be experienced and enjoyed.